Your essential guide to staying strong and independent longer. More energy, stronger bones, a better mood. It’s no secret why fitting exercise into your day is a good idea. Any movement is always better than none, but when it comes to maintaining your independence and performing everyday tasks with ease, the type of movement you’re doing matters. 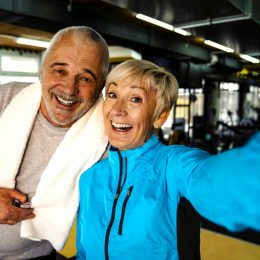 According to the Centers for Disease Control and Prevention, 61 percent of adults aged 65 and older are limited in their ability to perform basic actions, like picking something up off the floor or reaching to grab a cereal box from the pantry. You may not do these things in the gym, but don’t let that fool you: Many everyday tasks mimic basic exercises. 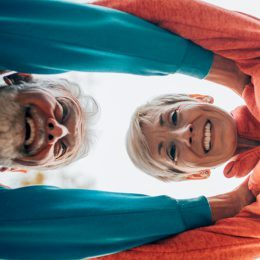 They’re known as functional movements, and being able to perform them is crucial for a long, active life, says Jessica Matthews, senior advisor at the American Council on Exercise and author of Stretching to Stay Young. 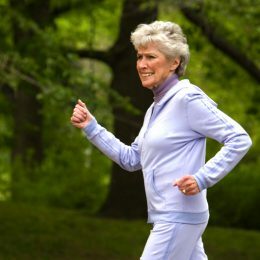 “To ensure our continued independence and freedom to do both daily activities—including self-care—as well as leisure activities that we enjoy, it’s important to develop and maintain quality movement patterns.” That second part—maintaining—is especially important because if you don’t use them, you’ll eventually lose them. “If we don’t move our bodies, we are no different than the car sitting on the lot that eventually rusts,” explains Kyle Stull, a National Academy of Sports Medicine trainer. In our bodies, “rust” shows up as joint dysfunction, degenerative joint disease, and other injuries that arise from lack of use. To stay rust-free, there are five primary movement patterns you should be able to perform: hip-hinge, single-leg, push, pull, and rotational. These patterns translate into the specific exercises below. You can work though the checklist at home or ask a trainer to monitor your movement at the gym. Either way, you’ll end up with a better understanding of your strengths and weaknesses—and learn how to work up to the moves you find challenging. And once they all feel good, you can put them together for a quick bodyweight workout that you can perform anywhere. “Hip-hinging or squatting movements are a staple movement pattern in daily routines: using the restroom, rising from and lowering into a chair, or bending down to pick up something you’ve dropped,” Matthews explains. Basically all the things you do multiple times per day (or more if you’re clumsy!). Try it: Stand with feet hip-width apart. Keeping your core tight, chest lifted, and chin parallel to the floor, shift weight into your heels as your hips lower down, as if sitting in a chair. Lower until your thighs are parallel or almost parallel to the floor, trying not to let your knees travel too far forward past the toes. Push through your heels to return to standing. That’s one rep. Do three sets of 10 reps to start. Boost it: Incorporate glute bridges or standing hip hinges into your routine, Matthews suggests. Both exercises increase hip mobility and effectively train the hinging movement that’s key to performing a proper squat. Whenever you walk down the street or climb up stairs, you’re essentially performing a single-leg movement, similar to a lunge, with every step, Matthews says. Try it: Stand with feet shoulder-width apart, hands on your hips. Take a big step forward with one leg, and slowly lower your body until front thigh is parallel to floor (knee is at a 90-degree angle). Make sure that your front knee doesn’t extend far past your toes. (If you have troublesome knees, you can lean slightly forward from the waist to reduce stress on the joints.) Pause, then press through your heel to bring your front foot back to start. Repeat on the opposite side. That’s one rep. Do three sets of 10 reps to start. If that’s too hard: Start with a smaller range of motion (don’t bend your knee to 90 degrees) or take a smaller step forward, Matthews suggests. You can also place one hand on a wall or chair to help with balance while building toward the lunge. The chest muscles involved in push movements are essential for one of life’s greatest joys: lifting your grandchild up in the air! You also employ these muscles when putting away groceries on high shelves or propping yourself up in bed from a lying to a seated position, Matthew says. Try it: Start in full plank position, with your hands slightly wider than shoulder width. Keep your core tight and head aligned with spine. Slowly bend your elbows, lowering your body toward the floor. Try to lower until your chest or chin touch the mat or floor. Pause, then press through your hands to return to start. Imagine you’re pushing the floor away from you. That’s one rep. Do three sets of 10 reps to start. 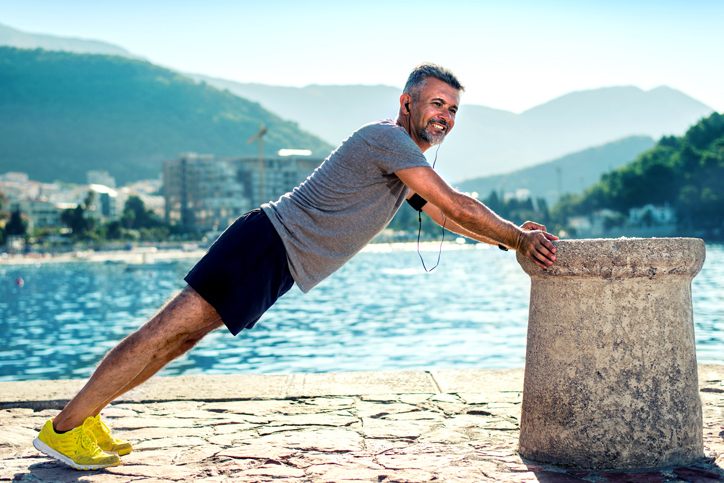 If that’s too hard: You can simply lower your knees to the floor, or place your hands on top of a sturdy bench or couch to perform incline pushups. If that’s still too challenging, try standing pushups against a wall or countertop, Matthews says. Try it: Tie a resistance band around a sturdy banister (or anything that will not move) at elbow-height. Grab the two ends of the band, palms facing each other. With your feet firmly planted on the ground and your chest up, pull the band straight back until your hands reach the sides of your ribs, squeezing your shoulder blades together as you do so. For added resistance, increase the distance between you and the banister. You can also perform rows with a cable machine at the gym. Do three sets of 10 reps to start. Boost it: To enhance mobility of the shoulder joint—and decrease the likelihood of shoulder-related injuries in the future—add some “floor angels” to your routine, Matthews suggests. Think snow angels performed on a mat or against the wall. Just like it sounds, this rotational move is the same motion that a lumberjack would use to chop wood. You do it more often than you may realize. From everyday tasks like putting on a seatbelt or shoveling snow to leisure activities like enjoying a game of golf or tennis, rotational movements are important, Matthews says. If you have any back problems, check with your doctor before performing rotational movements. Try it: Start in a squatting position, with your feet hip-width apart. Inhale as you twist to the left so your hands are outside of your left leg. As you exhale, lift arms diagonally across your body, ending twisted to the right with arms above your head. Pivot on your left foot as needed. Try to move with control rather than momentum. Do three sets of 10 reps on both sides. Boost it: “To help enhance mobility in the upper back to allow for adequate rotation, consider incorporating dynamic exercises such as a quadruped rotation into your routine,” Matthews says. To perform a quadruped rotation, start on your hands and knees. Place your right hand behind your head and slowly rotate your upper back inward so that your right elbow is pointed toward your left knee. Pause, then raise your right elbow toward the ceiling by rotating your upper back and head to the right as far as possible. Only rotate as far as is comfortable. Do three sets of 10 reps on both sides. This one sounds simple, but it takes a good amount of stability and core strength to do correctly. “Rolling over should occur easily from the front to the back and back to the front without assistance from your arms or legs,” Stull says. This is another one that may not be recommended for anyone with back problems, so talk to your doctor first. Try it: Lie down in an X position with your arms and legs out wide. From here, try to roll over onto your stomach without using your legs to push the hips or your arms to push the shoulders. Think about how a baby rolls over. Lift one leg up and across the body, continue reaching the leg until the body rolls over. The arms would move in a similar way, reaching one arm up and across the body until flipping over. Repeat the process to get back to starting position. That’s one rep. Do three sets of five reps to start. If that’s too hard: If you can’t flip over in this manner, it could mean you lack core stability, Stull says. Simply practicing this motion will help you develop the coordination to perform it. Go as far as you can, return to the starting position, and try again. Being able to hop can help you stay safe anytime you need to suddenly accelerate or decelerate, Stull explains. For example, stepping off a curb when a car unexpectedly speeds by and needing to step back to safety. Try it: A hop involves a one-foot takeoff and opposite-foot landing, Stull says. Rather than getting vertical, concentrate on form throughout the motion. Begin by standing on your left leg. Hold for 3 to 5 seconds to become steady, then hop to your right leg. Get your balance on the right leg for 3 to 5 seconds, and repeat on the other side. That’s one rep. Do three sets of 10 reps to start. If that’s too hard: If you have trouble balancing or any joint problems, don’t hop. Instead, step from one leg to the other, but move more quickly than a normal step. If that feels good, you can slowly work up to a hop over a period of days or weeks.